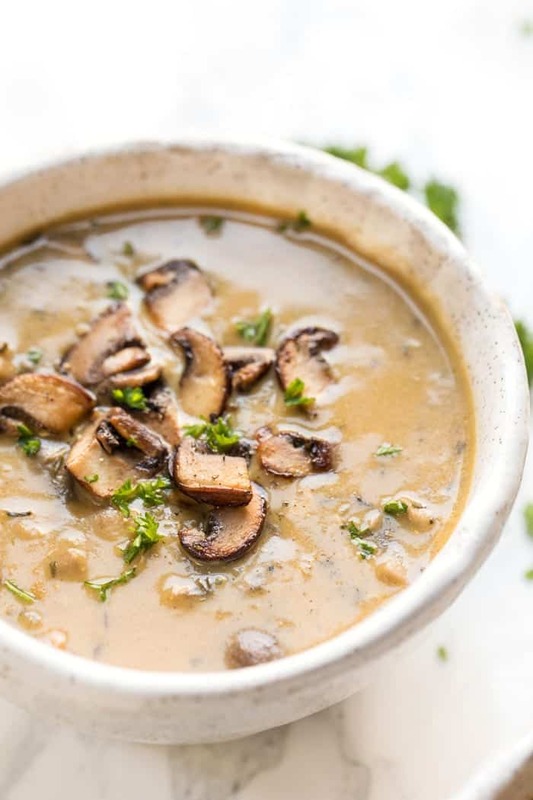 This mushroom quinoa soup is creamy, naturally vegan soup made with coconut milk as the base. It's loaded with flavor, packed with healthy ingredients and makes for a perfect weeknight meal. When it comes to cozy recipes, I'm all for a creamy coconut soup. But coconut and mushroom? For the longest time, I thought that was a crazy weird flavor combination. I grew up with mushrooms in Italian style dishes with tomatoes, beans, pastas, stews, etc., that adding them to something Asian-inspired just seemed wrong. But then in college, I fell in love with Thai food – especially Tom Kha Gai. This is a traditional Thai coconut soup that uses coconut milk as the base along with chicken, galangal, kaffir lime and mushrooms. It's heavenly and I've been a fan of the coconut mushroom combo ever since. 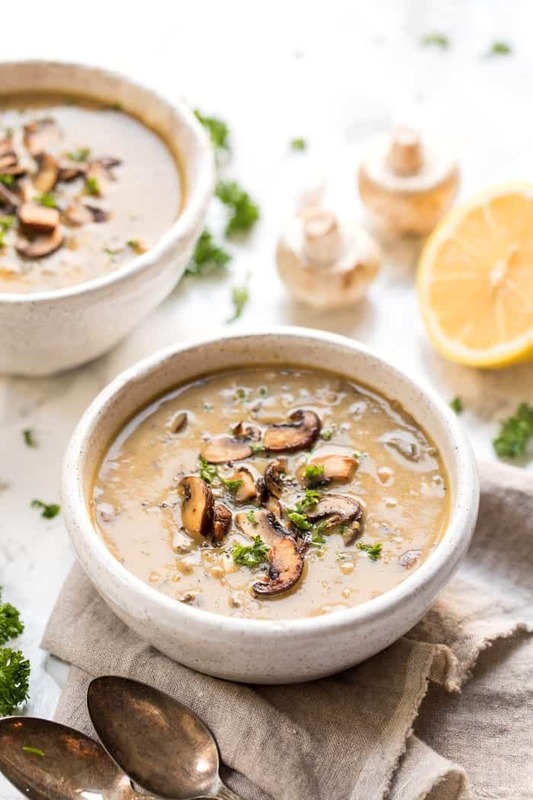 So today I'm going to share my almost-spin on this soup in this deliciously creamy Coconut & Mushroom Quinoa Soup (really it's just the coconut + mushroom we're stealing). It's a snap to whip up, has the most amazing texture and the flavor is on point! I know not everyone out there is a mushroom fan, which is totally fine, but for me, they're one of those vegetables that I simply adore. Maybe it's because my Italian side of the family are mushroom farmers or maybe it's because I love how they add meatiness and richness to a dish, without being overpowering or heavy. But more likely it's a combo of the two. But maybe my favorite thing about mushrooms? They soak up flavor like nobody's business. Which is why I think they pair perfectly with coconut milk. Coconut milk has a very delicate flavor, but it's also quite pronounced at the same time. I can almost always tell when a dish has coconut milk in it. But coconut milk (similar to something like cinnamon) also adds a natural sweetness, so if you're trying to cut back on sugary foods, I think coconut is a great option. I personally use it all the time, especially for quinoa breakfast bowls and my morning smoothies. For someone who doesn't have dairy milk in their diet, coconut milk has been a savior. Especially the full-fat variety. 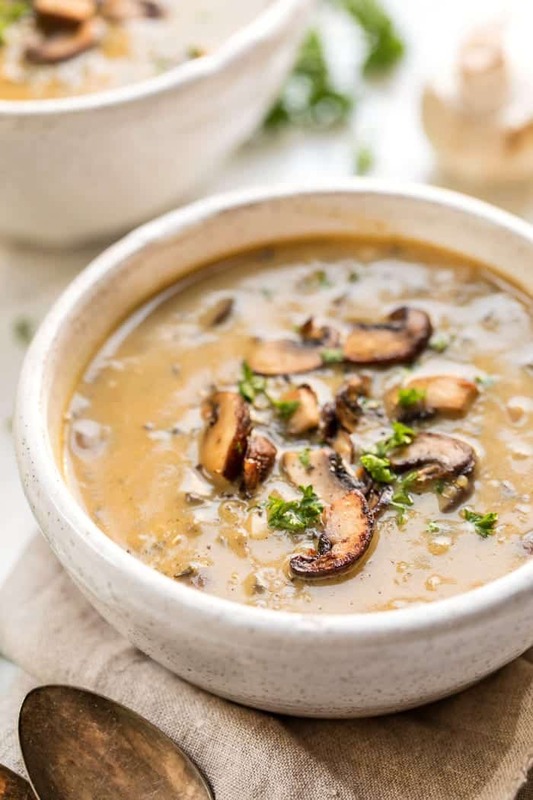 I use it to replace heavy cream in my baking, to thicken soups (like this Creamy Coconut & Mushroom Quinoa Soup), to make ice cream and also to make whipped cream topping. It's incredibly versatile, and while it is rather high in fat, it's packed full of healthy fats, so I don't worry too much about it. Just like I mentioned in this post about how to get more healthy fats into your diet, they're super important and many of us actually need more! And finally, we get to the soup. Oh the soup. I wasn't really planning to go in the coconut milk direction with this, but that's what I had in my pantry. You have to go with what you've got sometimes…and times like this it totally turns out for the better. This soup is full of creamy, coconut-y, mushroom-y, quinoa-y goodness. 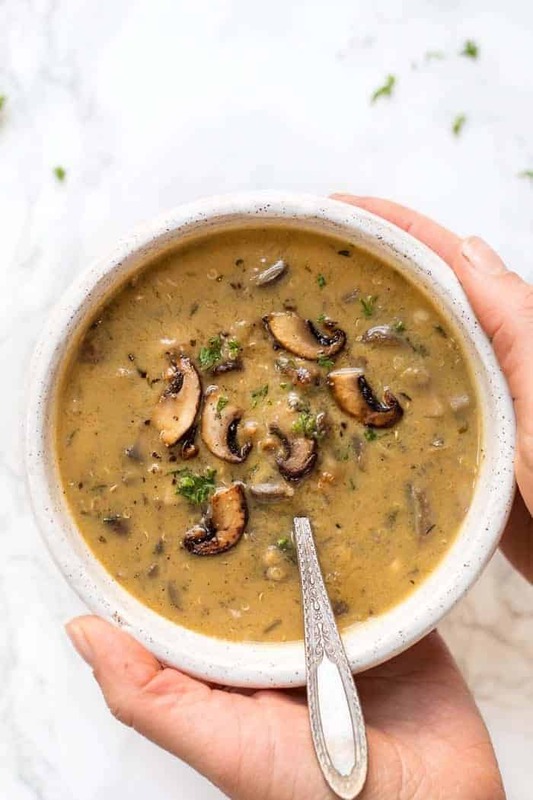 The broth has the faintest sweetness from the coconut, the mushrooms have sopped up all that delicious flavor and the little quinoa pearls lend a unique texture to the soup that makes it hearty, but at the same time surprisingly light and refreshing. It's a warm weather soup. A cold weather soup. And just a generally all-year round awesome kind of soup. Heat the oil in a dutch oven. Add mushrooms, shallots and garlic and cook until garlic is fragrant and mushrooms have started to soften, about 5 - 6 minutes. Add quinoa flour and stir to combine and mushrooms are coated. Add coconut milk & broth (start with 2 cups and add more if needed), followed by quinoa. Bring to a boil then reduce to simmer for 20 minutes, until quinoa is cooked. Add more broth here if needed. Stir in lemon juice, season with salt and pepper (and Sriracha if using). Cook for another 5 minutes. Serve immediately. 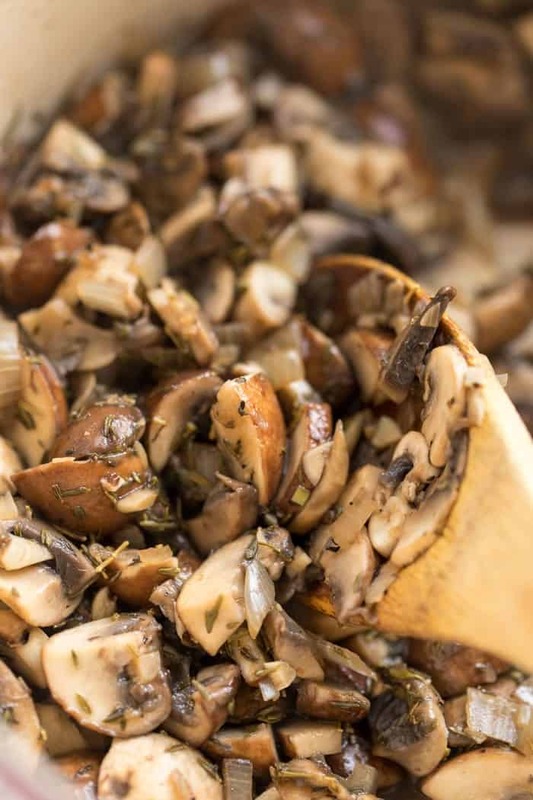 Garnish with fresh herbs and additional sauteed mushrooms. I’m new to using coconut milk, but I know that the solid separates from the liquid. Do you use both in your measurements? If so, do you have to blend it to make it easier to measure? Perfect comfort good! Just made it and could not help but have a second serving! Instead of Dutch oven I sateyed everything in the Instant Pot and then cooked for 2 min with high pressure. Thanks for this wonderful recipe! Made this today. Perfect for a cold day. Delish!! Thank you for a great recipe! Yay!! So happy you enjoyed it 🙂 Would love for you to give it a star rating if you have a sec! So I followed this recipe to a T. And I have to say that juice of 1 lemon was too much for me. I LOVE lemon. I’m obsessed. And I just couldn’t believe how lemony this was! It’s basically lemon soup haha. I added one more cup of broth. Didn’t help. So I added another can of coconut milk. STILL tasted too muich like lemon. So we added some turmeric, chilli powder, tried to turn it into a curry, since lemon is awesome in curry. It’s just ok now. I will still eat it. Just next time I will only add a tablespoon of lemon juice, or even just lemon zest! This looks so delicious! For the mushrooms, do you have a general weight estimate? Let’s say for just cremini with a dash of shiitake ;). Helps for my shopping planning! Thank you! I have made this soup for the soup party with my girlfriends and they all appreciated it so much. I think they will be visiting this blog as well. Thank you for your efforts! Makes me so happy to hear that!! Thank you, Emily!! I have a bunch of mushroom broth in my pantry. Would you suggest using it instead of vegetable broth in a recipe like this? I think it would probably make the soup even more mushroom-y, which I’m personally a fan of. What do you think? Definitely! I think that would be SO good! Excellent.excellent, excellent, Best creamy mushroom soup I have ever had. And so quick to make. Thanks for sharing. Amazing!! So glad you enjoyed it, Karen! Wow this soup is going down as my favorites! It was so tasty and finished by the family before I could get a second bowl! Thank you! Oh yay!! Mine too 🙂 I can never get enough! We tried this the other night and it was simply delicious! 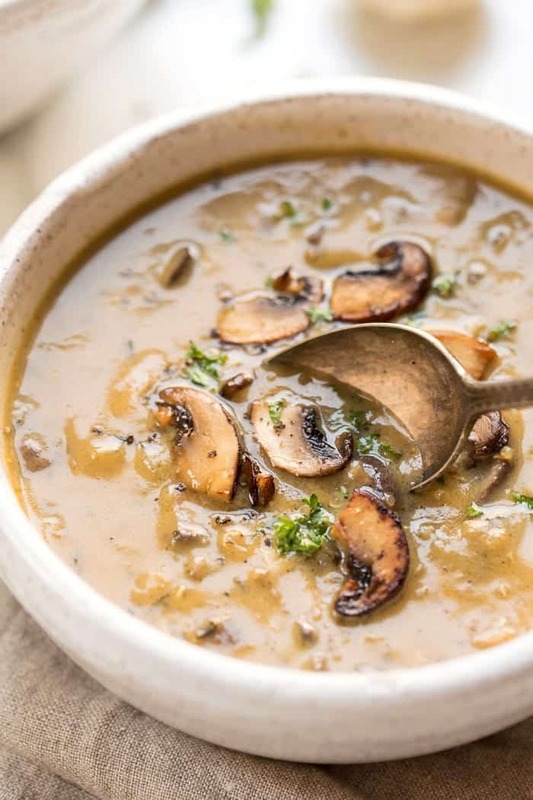 The combination of coconut milk and mushrooms is wonderful! Creamy, savory and satisfying! It was even better the next day. We will definitely make this again! 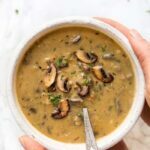 The mushroom coconut combo does sound unusual to me, but I love creamy veggie soups so I’m definitely into giving it a try! This is the best mushroom soup I’ve been ever had! It had an amazing buttery type flavor. I added some red pepper flakes and it was perfect. Will definitely be making it again. Hi Alyssa, this looks deee-vine! Can you please clarify the size in weight (oz or g) of the can of full-fat coconut milk? Sounds delicious! Can you make it in a crock pot? This looks amazing! Thanks for sharing. Can’t wait to try it this weekend! VERy good soup. Making it fort hen second time tomorrow! I’m so glad you enjoyed it, Nina!! Sorry for the typos. Very good soup! Making it for the second time tomorrow! I made this tonight and it is divine!!! Thank you for this wonderful recipe, it’s will be on high rotation as our colder months approach. My best friend is vegan and I’m constantly looking for great tasting recipes to impress her with….she loved it!!!! I made it again! I just love this recipe…comes out amazing every time! Thanks, Alyssa! Not only does the soup look delicious but I would love to know where you found that bowl..it is gorgeous! I admire vegan cooking, but I hate it when people use broth… it’s just disgusting…. You’re spoiling your food with chemicals, ruining the taste of the freshness… sorry. Quite a violent reaction to broth….lol. I save veggie scraps in a bag in the freezer. When the bag is full it goes into a large pot covered with water and simmered for a couple of hours. Then it gets strained and put in containers and back in the freezer. Nothing disgusting, no chemicals, no worries. Great recipe! Not only did my husband love it our 17 month old couldn’t get enough of it. She wouldn’t eat her fruit and veggies any more once she tried the soup. Thank you!!!! I’d love to give this recipe a try. I don’t have quinoa flour and am wondering if I can sub it out for whole wheat flour or something else? I was wondering the same thing! We make a proprietary gluten-free flour blend at home and have many gluten-free flours on hand… except quinoa flour. Would it work to use almond instead, for instance? Yep! Any flour will work 🙂 Except maybe coconut! If I have cooked quinoa, can I add it instead? Could I use a bit more and cooked for less time? I’m really looking forward to this soup! Yes, I think you could! I’d say that you just add it in at the very end (maybe 5 minutes left of cooking), and reduce the liquid by at least 1/2 a cup. Perhaps just start with 1 1/2 cups water and then add more as needed. Let me know how it turns out for you! Great timing! I needed to use some mushrooms and this turned out to be the perfect soup for a snowy Oregon Sunday. My husband exclaimed “wow!” after the first spoonful. It was quick and easy. We’ll definitely make this again.